Troop 35 is by many measures the best troop in St Clair District, producing the most Eagle Scouts in the District even though we aren’t the largest Troop. One of the new Asst. District Executives, Kevin Buhr, stopped by a meeting after we had a very successful Friends of Scouting campaign to witness what made Troop 35 successful. He remarked that the Troop had very involved leaders. Those measures of success can be taken for granted if the “program” by which Troop 35 produces Eagles is not passed along to successive leaders or if parents aren’t recruited, maybe even expected to contribute to the success of the Troop. Then there is the true measure of leadership succession within a Scout troop…do the Scouts ensure they are growing leaders among themselves who are ready to take the next leadership step. Are they encouraging the Scouts coming up to be Patrol Leaders and Troop Guides, attend National Youth Leadership Training, and ensuring that those Scouts are motivated to run for election of key leadership positions. 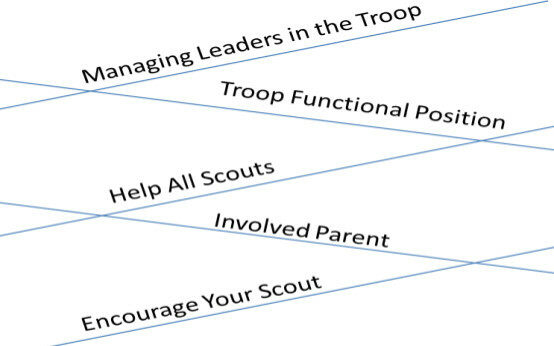 This guide will outline some key principals to follow for adults and Scout leadership succession. The future of Troop 35 depends on how well the next generation of leaders are prepared to take the Troop in new directions and to new possibilities. place to ensure that a pipeline of leaders are being prepared for key jobs by having the experience of taking on a previous positions and receiving the training for that position. Experience and training build leaders who are ready. Conversely, you aren’t ready as a new parent in the Troop to take on Scoutmaster on Day 1. So, how do you get build the pipeline of leaders who have had the experience and training? In the book, The Leadership Pipeline How to Build the Leadership-Powered Company, Ram Charan, Stephen Drotter, and James Noel describe a series of passages that a leader takes, a step that involves adopting new “skill and value transitions” as you move through each passage. The model used for a small business is adapted here for a scout troop (image below). Even the most involved Cub Scout leader has to transition to Boy Scouting. Just like all parents, they are starting off in a role of Encouraging Your Scout where they see their responsibility in the troop from a perspective of what would encourage their own Scout’s involvement in the troop. They drive their Scout to meetings, ask about upcoming events/sign permission slips, pay dues/campout fees, and the list goes on. This is not an insignificant job…but the value transition that occurs is that parents realize that they need to help the Troop program grow. As they understand the principles of Boy Scouts and how the troop operates, they realize they can offer some skill they have to the program and they become an Involved Parent. Involved Parents like to have fun in Scouting. They enjoy the activities and see the difference Scouting is making in their Scout’s life. They want to see the Troop succeed and know it takes Involved Parents to make that happen. These leaders drive to campouts, pulling the trailer if they can’t remain for the weekend. They might attend a campout or man a fundraising booth when their schedule allow. They begin to understand the skills of Scouting to include the Patrol method, along with the values to let Scouts lead activities and only stepping in for safety issues. The next step might be for a parent to take a role in the troop to Help All Scouts. Leaders at this stage are typically committee members without a specific job. They may provide backup to other committee member with specific responsibilities on the committee. They could also be merit badge counselors or lead a fundraiser or a special project for the troop. These roles require an adult leader to register and take Youth Protection and Committee Challenge (on-line) training. While this training is minimal, this emphasizes the safety, values, and organization of Scouting to reinforce the values they have observed in the troop. These leaders understand that Scouting requires Scouts to lead and for the adult leaders to ensure safety and to guide and encourage Scouts. Naturally, leaders take on a specific position within the troop. There skills and interest may push them in the direction of committee members who organize the administration of the troop or they may value more directly interacting with the Scouts as Assistant Scoutmasters. This level requires more commitment and depending on the position, may require position specific training. The Scouts deserve to be led by trained leaders who understand the values of Scouting and can help reinforce the values and skills the Scouts are learning in their leader training. The final transition is to move from a Functional Responsibility in the troop to managing leaders. These positions include Committee Chair, Scoutmaster, Unit Commissioner, and Chartered Organization Representative. The last two positions are representative of the District and the organization that charters the troop so I will leave them out of the troop leadership pipeline. Nonetheless, all of these positions are more about leading the leaders in the troop, both Scout and Adults, rather than performing a specific function or role. This plan won’t go into detail on Scout leadership development but will touch on a model and a few key transitions so adult leaders are familiar and can discuss Scout leadership development with Scouts. This model is based on my observations of leadership development in Scouts and doesn’t reflect what is required for advancement. Please consult the current requirements in the Scout Handbook for the leadership positions and the duration that position must be held to meet the requirements for Star, Life, and Eagle. 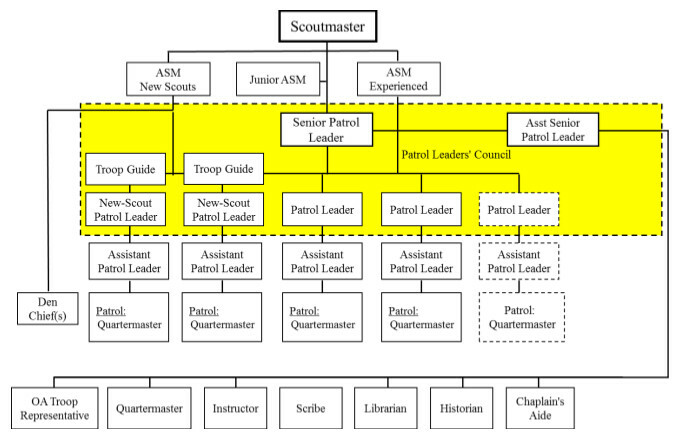 Rather this leadership model is based on the Troop 35 organization chart (shown below) as taught in our Introduction to Leadership Skills for Troops(ILST) leadership training. The key differentiation among leadership positions are those that are in white and those that are in the yellow block noting that they are key members of the Patrol Leader’s Council (PLC). 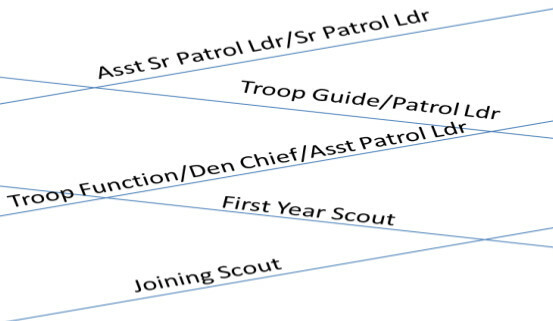 While all Scouts may participate in the Patrol Leaders Council, certain leadership positions have responsibilities in the PLC to represent their new Scout Patrol, Patrol, troop functions (report to Assistant Senior Patrol Leader) who in turn report to the Senior Patrol Leader who is the top leader in the troop. A Scout leadership model might look like this where a Scout joins a troop, becomes an Active First Year Scout, takes on a leadership position, and eventually becomes a key member of the PLC. Finally, a Scout who leads other Scout leaders, such as the SPL and ASPL, gains the most opportunity to influence the vision and outcomes for the troop. This guide won’t detail the skill and value transition between these leadership positions as much of this is covered in ILST. If you’d like to encourage a Scout to take on a new level of leadership, you first have to understand their readiness in terms of their skills and value. The key questions are why the Scout feels they would do well in that position and what they would you like to accomplish (i.e. what is their vision). Also, many jobs are elected so they will need to gain the respect and confidence of their peers and essentially answer those two questions for their peers. If you listen to most Scouts give a short speech before troop elections, they highlight what they’ve done and where they want to go if elected. So, we now have a model to develop leaders and everyone will jump in and work their way through the leadership pipeline…maybe that works for one or two individuals, but others may need some help and encouragement. As discussed earlier, the leadership pipeline has some distinct transitions that requires what Charan, Dotter, and Noel described as “skill and value transitions”. Often, these transitions require some level of experience and some training to help the leader make the transition. I will discuss each of the transitions and offer ideas on how troop leaders can encourage individuals to make the transition successfully. First, let me offer that not every troop leader needs to set their objective to be a top leader in the troop. While the troop needs leaders, there isn’t anything wrong with serving the troop in a role helping all scouts or as a troop functional leader. I’d offer one anecdote about a leader in our troop who served as a merit badge counselor and attended many campouts with a job as a committee member where he didn’t have a specific function. Nonetheless, several scouts in Scoutmaster conferences mentioned this individual as a positive influence on them since he was approachable and friendly to all scouts…probably because he always cooked dessert in a dutch oven on campouts, teaching scouts how to cook and giving them some dessert to enjoy around the campfire on a Saturday night. Rather than leave it to chance that someone will take the actions described, the Scoutmaster and Committee Chair should discuss leadership development and perhaps follow specific individuals or leadership roles in the troop. Typically, the committee chair will work with parents and leaders interested in running the administration functions of the troop while the Scoutmaster would work with leaders who gravitate toward directly working with the Scouts. · Create opportunities…identify positions that need a back-up or can have multiple positions, Assistant Scoutmaster and Advancement, for example, and ask leaders to start in a back-up role allowing them to move into a primary position later. Also, there are positions on the committee that often go unfilled and are distributed to other leaders...offer interested leaders the job and work with those who are currently doing the job to transition the responsibilities. “Every parent leads” is a slogan some troops use as they welcome new parents to the Troop. Without having to insist on that philosophy, Troop 35 is a Troop that has had good involvement from adults leaders who are willing remain involved over a long period of time. That pipeline of leaders often seems static, but they need mentorship and coaching to contribute their full potential to Scouting. The key is to understand that the leaders all need different styles of coaching to get through a transition from one stage depending on their background with Boy Scouts and depending on their transition to new levels of leadership in the troop. That isn’t to imply that those who don’t move up aren’t contributing…some leaders may be best serving the Scouts right where they are. The job of a good Scoutmaster and Committee chair is to recognize when a leader is ready to move up to a new level and to engage them to help the leader transition. This paper presents a model and develops ideas on how to engage leaders at key transition point. The Scouts deserve good leadership that results from using the leadership pipeline model to build a troop that is well led by the Scouts and the adults.